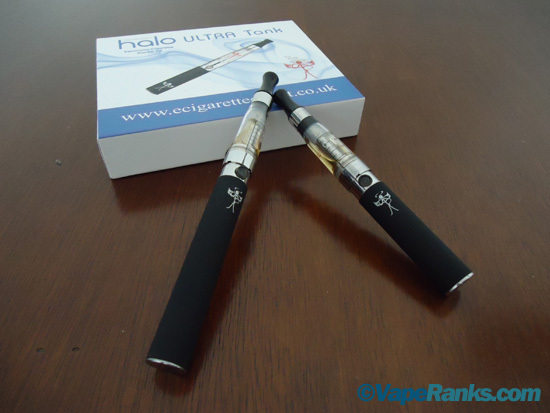 Most of the electronic cigarettes I’ve reviewed so far have been analog-like mini models, because that’s what the majority of smokers are interested in, and while I love my trusty KR808, I’m also a big fan of eGo-style e-cigarettes. 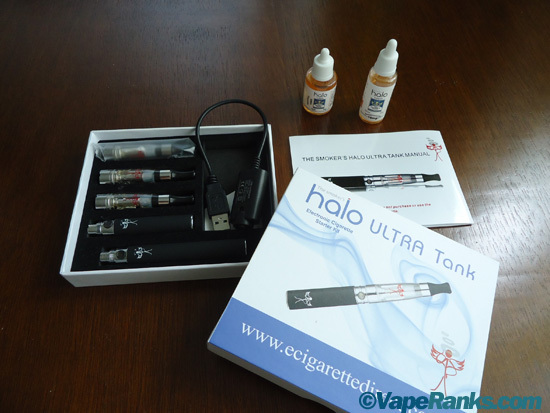 So when E-Cigarette Direct offered me the chance to test their Halo Ultra Tank starter kit, I jumped at the opportunity. It may not have that familiar cigarette look that so many newbie vapers are drawn to, but it’s just as easy to use and it gives users the chance to experiment with a bunch of different vaping accessories. Also, it’s one of the most popular setups right now, and that alone sparked my curiosity. E-Cigarette Direct is an e-cigarette supplier from England, and apparently they do packaging a bit differently over there. Unlike the rectangular magnet top box used by the vast majority of US brands, they opted for a square, flat cardboard box, which to my surprise had plenty of room for the batteries, clearomizers and different accessories. 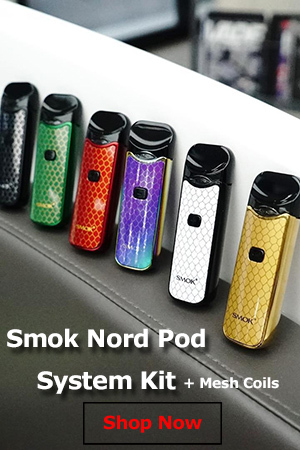 The kits comes with two eGo batteries, one 650 mAh, and one 1000 mAh, three 1.6ml CE4 (Stardust) clearomizers, a USB charger, two bottles of e-liquid and a manual. You notice something pretty important is missing from the package – the wall charger. I know it’s the 21st century, but sometimes the old power socket is much more convenient, especially when you don’t have access to a USB port. Unfortunately, you have to buy the charger separately, for £6.50 ($10). They’re not the only company that doesn’t include the wall charger in their starter kit, the popular South Beach Smoke also only comes with a USB cable. Maybe it’s a move to make their kits more affordable, but personally I think throwing in the extra charger is the way to go. The batteries have a nice rubber coating for improved grip and the Smoker’s Angel” logo stamped on them. The CE4 clearomizers are also branded with the company logo and perform remarkably well even after weeks of constant use. The CE4 or Stardust clearomizer is made up of a metallic battery connector positioned at the bottom, a clear plastic tank that can hold up to 1.6ml of e-liquid, two wicks that feed the liquid to the single coil atomizer and a custom drip tip. It looks like a small tank, only it’s a lot easier to use and refill. All you have to do is unscrew the plastic tip, tilt it a little bit and fill it up with e-liquid, screw the tip back on, connect it to the battery, and you’re good to go. The tank is made of hard plastic so it doesn’t break easily, it holds lots of juice and you can use it until the atomizer gets fried. Mine are still in great condition, but I’ve read complaints from users of similar models who said their clearomizers died after only a couple of refills. It’s a matter of luck, really. You have to remember these are disposables, so you’ll have to replace them sooner or later. What can I say about eGo batteries that hasn’t already been said? They’re reliable, small enough to fit in your pocket and will last a great deal longer than any mini-style battery. 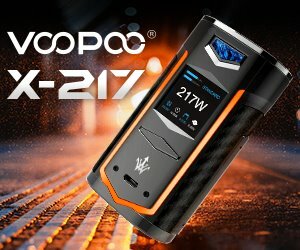 Some ex-smokers feel awkward using something that looks nothing like tobacco cigarettes, especially in the beginning of their vaping career, but if you don’t have a problem with its bulky design and having to push a button to activate it, the eGo is a great device. The 650 mAh unit obviously stores less power than the 1000 mAh battery, but it’s also considerably smaller and will make you less conspicuous when vaping in public. I’ve used the Halo Ultra Tank every day for the last couple of weeks, and during that time I’ve gotten about 10 hours out of the smaller battery, and around a day and a half out of the large one. That’s not bad, considering most conventional electronic cigarettes will die on you after just a couple of hours. It all depends on how heavy you use them, but on average, the two eGo battery should keep you vaping for at least two days. There’s no questioning the quality and efficiency of eGo batteries, but it’s the CE4 clearomizers that really set the Halo Ultra Tank system apart from the many other eGo setups. Think of them as a combination between cartomizers and tanks, designed to make it easier for users to play around with juices, without dealing with messy refilling and frustrating leaks. The original atomizer and cartridge system was replaced by the much more efficient cartomizer, and a lot of experienced vapers are saying the clearomizer is the next evolutionary step in the e-cigarette industry. 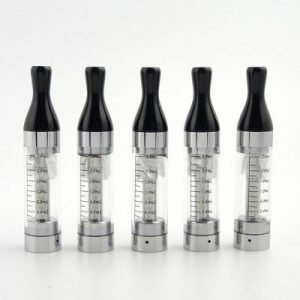 It remains to be seen if it will indeed render the trusty “carto” obsolete, but one thing is for certain – the clearomizer makes advanced vaping available to the most inexperienced user. I’ve tried the original atomizer and cartridge e-cigarette combination, the eGo tank system, dripping, but I always remained faithful to the cartomizer. It might not hold as much e-liquid as other more advanced setups, and it’s a pain to clean if you don’t have the finances for new ones, but its ease of use had been unmatched. So I was curious if these new clearomizers would make me a convert. I have to say they are indeed easier to refill than cartos and can a lot more e-liquid. But there are also a few things I didn’t like about them. First of all, it burns through e-liquid like crazy. I have never been a heavy smoker and I don’t consider myself a heavy vaper, but I had to refill the clearomizer at least two times a day. That’s 3.2ml of e-liquid, more than twice my daily use with an XL cartomizer. The Halo Ultra Tank vapes amazingly, but you really have to stock up on juice. The other problem I had with it, and this is a subjective issue, the draw felt too airy too me. The first time I pulled on the drip tip, I thought the clearomizer was broken and I was just sucking in air, but the strong throat hit and thick plume of vapor proved otherwise. There smoking-like drag I felt when using cartomizers was gone, and it felt a little funny to me. I got used it after a while, but if I had to choose between the two, I’d go for the cartomizer. But that’s actually the beauty of using 510 connection batteries like the ones in the Halo Ultra Tank System. If you’re not satisfied with their performance, you can easily replace the CE4 clearomizers with pretty much anything else available on the market, from atomizers to cartomizers or other tank systems. The high-quality batteries allow you to experiment with different accessories without paying for a new kit and that alone is worth the £39.98 ($60) price. As I mentioned above, The Smoker’s Halo Ultra Tank vaporizer burns through juice like crazy, but the good thing is it shows in the vapor production. Even a short draw is enough to fill your mouth with vapor and make you look like a mythical dragon when you exhale. Yes, it’s that good. And keep in mind that the liquid that comes with this thing has a propylene glycol base, not vegetable glycerin. I happened to have some VG juice around and filled one of the CE4 clearomizers with it, to see if the vapor production could get any better. It did, but I would recommend you either stick with PG or at least try a mix propylene glycol and vegetable glycerin, as the thick VG e-liquid will gunk up the clearomizer very fast. In conclusion, the Halo Ultra Tank is a true vapor monster. You’ll definitely get more “smoke” out of it than you would from any other vaporizer this size, and smaller e-cigs, while some are satisfactory, don’t even come close. So if you’re willing to sacrifice conventional cigarette looks and size for pure performance, this is a great choice. 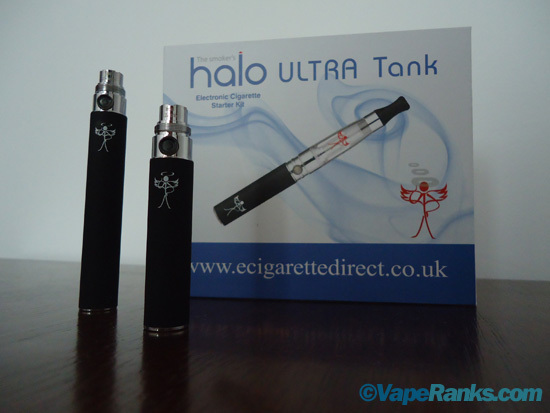 The Halo Ultra Tank comes with two 15ml e-liquids of your choice, and there are 20 available flavors to pick from. Most of them are PG-based, which I prefer, but the E-Cigarette Direct website also lists a vegetable glycerin tobacco flavor, if you want to give it a try. 30ml of e-liquid might sound like enough to get you started, and while that may be true for cartomizers, this is a completely different system, and in two weeks time you’ll be looking at two completely empty bottles. Obviously, it all depends on how much you vape, but it’s a known fact that most newbie vapers tend to over do it. I got the Raspberry and Pineapple Coconut Rum e-liquids with my kit, and while I wouldn’t say they are poor quality, they nothing too impressive either. When I first popped open the two little bottles and took a quick sniff, they smelled divine, and I was sure they were going to be some of the most delicious juices I had ever vaped, but they turned out to be just run of the mill Chinese e-liquids. Again, not bad, but there are so many suppliers specializing in high-quality e-liquid that’s it’s hard not to notice the difference. The Halo flavors probably won’t blow you away, but they are definitely good enough to make you want to keep vaping. It may not be perfect, but if you’re willing to overlook its few flaws (some of which are subjective) the Halo Ultra Tank system is one of the best vaporizers available right now. The eGo batteries have a long battery life, great build quality and are compatible with loads of other accessories, while the CE4 clearomizers are easy to use, hold lots of juice and vapor production is phenomenal. I normally recommend ex-smokers begin their vaping experience with mini-style e-cigarettes, but this setup is so easy to use anyone can try it. This is the best system I have tried. I have also tried most of their flavours and I have to say that the previous reviewer did pick two of their most bland flavours, my personal favourites are cherry, coffee, cola and desert blend; which are all gorgeous. Well worth the money and excellent customer service to boot! You probably put too much e-liquid in the clearomizer and flooded the built-in atomizer and air hole. Try taking some of the juice out and take a few puffs to “burn the excess liquid in the atty. Hi,just received my ultra tank starter kit and to my surprise it contained a wall charger and usb charger,been capping all day and think it’s fabulous,will do another review in a month’s time to update you all. Fabulous!!! This is my first ever evcig and after over 30yrs smoking (roll-ups for last 15) i have now been tobacco free for 8 whole days thanks to Halo!! No intention of lighting up again. Great product, but note that it’s not made in “England”, but in Wales.